Increase the perceived value and gain a Wow Factor for your calling cards, loyalty cards and credit cards with some flair and unique finishes. Elevate Your Brand. Stand Out. Grab attention for your card with an interesting look using authentic metal finishes. Over 100 years experience as a supplier to premium brands for decorative trim and brand identification has taught us a few things. Attention to detail and quality are key elements to each job that goes through our manufacturing areas. 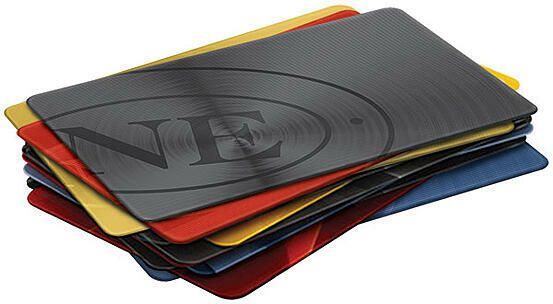 Stainless steel offers the durability of metal in a calling or credit card. A wide range of pattern and finish structures means versatility and opportunity for your personal flair to be shown. Change the color, showcase your name, your brand, your event - make it your own. Let us be your strategic partner. Northern Engraving is a member of the International Card Manufacturers Association (ICMA). Collboration for a finished card can be coordinated with recognized members of ICMA such as XCore Technologies. I Want to Know More About Decorated Metal Cards.